There are so many amazing causes that need support that I have decided to highlight them from time to time on my blog. I have some ideas for chartible organizations, businesses doing good work, individuals making a difference, that I will blog about in the next few weeks. If you have any suggestions of groups I should highlight, drop me a line and I will check them out. Below is an email I just recieved from UNICEF. I am on their mailing list because they have some great educational resources and because they are doing important work in some of the most difficult places on our planet. There are a relatively small number of NGO's (non-government organizations) that are still allowed to work in Darfur since the world courts issued the arrest warrent for the president of Sudan. The ones that are left are struggling to keep up with the enormous need. Support the children of Darfur. Please donate now. Take Action Today! 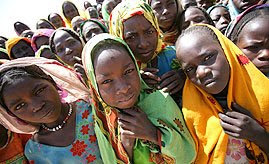 Help the children of Darfur. The situation in Sudan, following the decision by its government to expel 16 aid organizations (also known as non-governmental organizations or NGOs), is urgent. These 16 NGOs represent roughly 40% of the humanitarian workforce in Sudan and partner closely with UNICEF to provide lifesaving assistance. UNICEF is still operational in Sudan, including Darfur, and is working around the clock to meet children’s immediate needs. UNICEF has urged the government of Sudan to reinstate the NGOs as soon as possible and expressed grave concern that children will suffer should humanitarian aid be further disrupted. Water, sanitation, health and nutrition programs provide essential aid to 4.7 million people in Darfur region alone. The next three months will be especially critical. But the impact of the absence of NGO partners—and the resulting loss of capacities—will continue to be felt well beyond this period. Today we are asking donors and friends to help us by increasing the support you already show. We're asking you to go one step further—and quickly—so we can keep the water flowing, the food supplies delivered, and the vaccines administered for the next couple of months. Regardless of the complexities, politics or cultural issues at play, zero children should have to die as a result of humanitarian aid disruption. We are asking the millions of Americans who have supported the Darfuri people to help during this very difficult time.